Sometimes you just want what's familiar but with a hint of something different. Dating is one example in which this applies. You know what you like, what you enjoy and what you're hopeful to find in someone to share your life with, but you welcome those fun, little quirks, nuances and 'things' they bring to the table. When asked, 'What's your type?'... it's somewhat difficult for me to answer. I don't especially like categorizing people. There just has to be some kind of connection or synergy in all areas - intellectually, socially, emotionally, physically, etc. But it's those quirks that make someone stand out and keep me interested. I guess that's the whole tricky thing about dating. Talk about finding a needle in a haystack! Thankfully I'm in no rush and there's far too many things I want to do before getting into anything serious. For this dish I used their Basil & Garlic penne. You don't even have to cook it to be able to taste how strong and flavorful it is. Once cooked, the pasta holds its own really well and the flavor truly stands out. 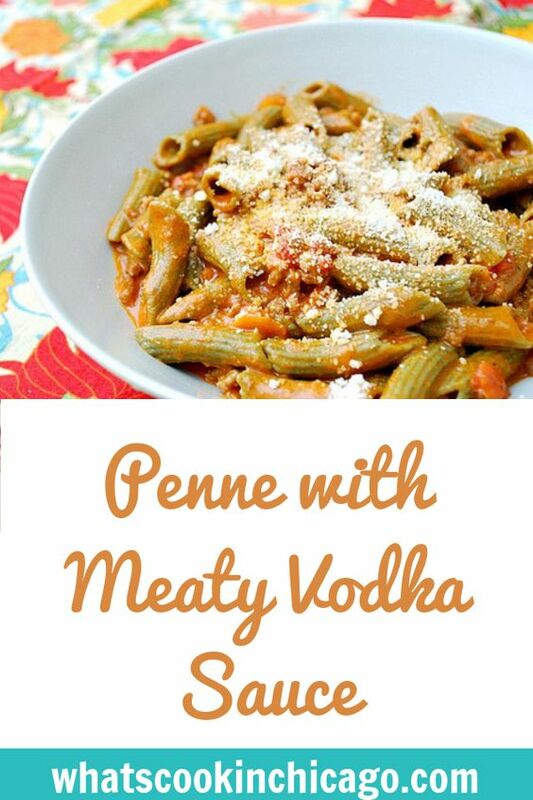 To pair with the basil and garlic flavor, I made a traditional Vodka sauce which I added ground beef to. The complexity and depth of flavors from the sauce works exceptionally well with the pasta and I'm sure it will elevate any pasta you choose. In a pot, heat oil over medium-high heat. Add onion and garlic and saute until soft and translucent. Add celery and carrot and season with salt and pepper. Saute all the vegetables until soft. Add tomatoes, basil, and bay leaves and reduce the heat to low. Cover the pot and simmer for 1 hour or until thick. Remove bay leaves and taste for seasoning. If sauce tastes too acidic, add unsalted butter, 1 tablespoon at a time, to round out the flavor. Meanwhile, brown the ground beef in a pan and season to your tastes. Drain from any fat and set aside. Pour half the tomato sauce into the bowl of a food processor and process until smooth. Continue with remaining tomato sauce. Simmer the processed tomato sauce, vodka and ground beef in a heavy large skillet over low heat until the mixture reduces by 1/4, stirring often, about 20 minutes. Stir the cream into the tomato vodka sauce. Simmer over low heat until the sauce is heated through. Stir in the Parmesan cheese until melted and well blended. Meanwhile, cook the pasta in a large pot of boiling salted water until al dente, tender but still firm to the bite, stirring occasionally. Drain the pasta and transfer it to the pan with the sauce, and toss to coat. To serve, garnish with Pecorino Romano cheese. 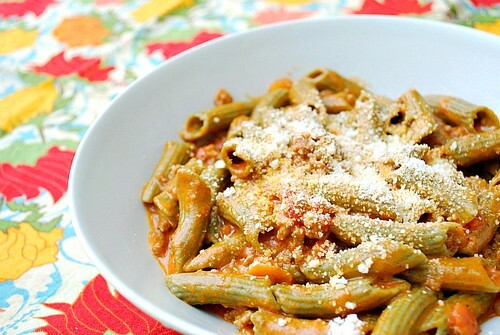 What a tasty dish using gluten free pasta, and I'm so happy that you are out there having fun dating guys. Because finding that needle in the haystack will be worth the trouble!! which best vodka is better for make good sauce? and decide to drive referral traffic for your site with social book-marking submissions. optimization, search engine marketing, and MSN Adcenter.